For almost two decades my parents lived in the quiet oceanfront town of Pacific Grove, just west of Monterey, California. One December day after September 11, 2001, my husband and I tied the knot in a small bed-and-breakfast overlooking the Monterey Bay. It didn’t take long for us to fall in love with the place. At a comfortable distance from California’s major cities, the area has all of the first-class amenities of any West Coast metro area without the hustle-bustle hassle of crowded restaurants and attractions. Two hours south of San Francisco and five hours north of Los Angeles, Monterey is famous as the setting for Steinbeck’s Cannery Row near some of the most prolific cropland in California (growing artichokes, strawberries, greens and grapes, to name a few). The coast’s magic captivated poet Robinson Jeffers, who hand-built a home and stone tower, Tor House, in nearby Carmel well before Clint Eastwood arrived. Some of the most spectacular sections of Highway 1 snake along the hills and cliffs between Monterey and Big Sur (about an hour’s drive), which take you through several state parks and wilderness areas. Whether the water is brilliantly glittering in the sunshine or cool and subdued with summer fog, California’s central coast is peaceful and uplifting. Enjoy the best of Monterey Peninsula and nearby coastline with these insider tips. Take an otter- and bird-watching walk, jog or bike ride. A welcome change from Southern California’s sandy, palm-studded beaches, the peninsula’s rocky coast boasts cypress trees and exuberant marine wildlife—from brilliant tide-pool starfish and anemones to sleek saltwater otters and stoic white egrets that play, eat and perch in thick kelp beds that float just a few dozen yards off shore. Although spectacular state parks are a short drive from Monterey (see number 4, below), some of the best views of the bay are accessible by paved footpath as you head west from the aquarium. Starting at the Hopkins Marine Station (with its loud colony of sea lions), the path reaches Lover’s Point in a little less than a mile. The paved path ends there, but footpaths continue around the peninsula. Want to enjoy some of the freshest produce on the planet? Just look for signs for numerous farm stands along most major roads out of the city. Monterey County grows an astounding 61 percent of the leaf lettuce we consume in the US. Other high-volume crops include head lettuce (56 percent), broccoli (48 percent), spinach (38 percent) and strawberries (28 percent). Throughout the year, nearby towns host festivals for local produce—Castroville for artichokes, Gilroy for garlic, for example. There probably isn’t a single restaurant chef who doesn’t make good use of the region’s cornucopia of fresh ingredients. Some of our favorites include Passion Fish (for seafood), Peppers Mexicali Café (for artichoke-mushroom enchiladas), Happy Girl Kitchen (for local jams and pickles), and Il Vecchio (for house-made gnocchi). Need a sweet? It’s worth the short trek to Patisserie Bechler, where master baker Gérard Bechler whips up divine croissants, Danishes, cakes, tarts and napoleons. Enjoy oenoculture in Carmel Valley. Lesser known than Napa, but still a hotspot for oenophiles (wine lovers), the nearby Carmel and Salinas Valleys are dotted with dozens of small, mostly family-owned wineries that offer hard-to-find pinots, syrahs and chardonnays. There are over forty-two varietals of grapes grown in the region, where lime-rich soils, hot days and cool coastal nights create perfect growing conditions for grapes such as Pinot Noir and Chardonnay. Look for wine-tasting maps at tourist info kiosks, or visit www.montereywines.org. Take a bath—a forest bath. The Japanese relish shinrin-yoku, roughly translated as “forest bathing.” Recent studies show that the practice lowers stress, boosts well-being, and may improve immunity. It’s simple: Spend two to four hours walking slowly and resting in a forested area. Along the coast south of Monterey to Big Sur, you’ll find exquisite forest bathing opportunities in protected lands with diverse, wild ecosystems—from complex, desert-like coastal chaparral to thick redwood forests. I hesitate to tell you about these locations—these quiet, beautiful, sacred territories that should remain sanctuaries. Nevertheless, I recommend forest bathing at Point Lobos State Natural Reserve; Soberanes Canyon in Garrapata State Park; or any of the forested trails in Andrew Molera or Julia Pfeiffer Burns State Parks. Whatever my mind state, I am always profoundly replenished by spending time in these spots. Get bedazzled by ocean life. 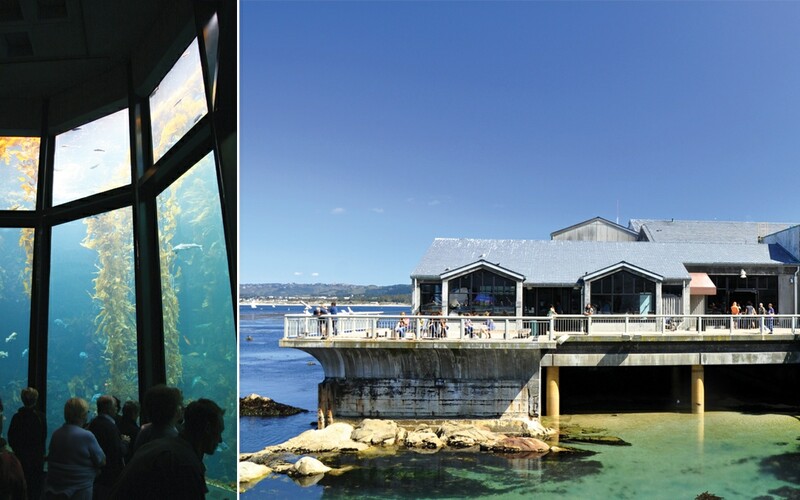 Perched at the edge of one of the largest marine sanctuaries on the planet, the Monterey Bay Aquarium has been at the forefront of ocean conservation since it opened in 1984. Its tanks and exhibits are designed to be as visually striking as the unusual water creatures they contain, and our family has spent many captivated hours immersed in its stunning marine underworlds. With many world fish populations endangered or in steep decline, Monterey Bay Aquarium’s Seafood Watch program (www.seafoodwatch.org) helps chefs, restaurants and diners choose the most sustainable seafood for their plates. The aquarium regularly partners with sustainable chefs and local purveyors to bring aquarium-goers tastings and demonstrations. If the aquarium is high on your list, plan your visit to coincide with some of their special events, like Sustainable Foods Celebrations: World Oceans Day, June 6–7, 2015, or the Make It Sustainable Weekend, October 3–4, 2015. Or enjoy sustainable seafood—and the view—at the aquarium’s restaurant, Cindy’s Waterfront.